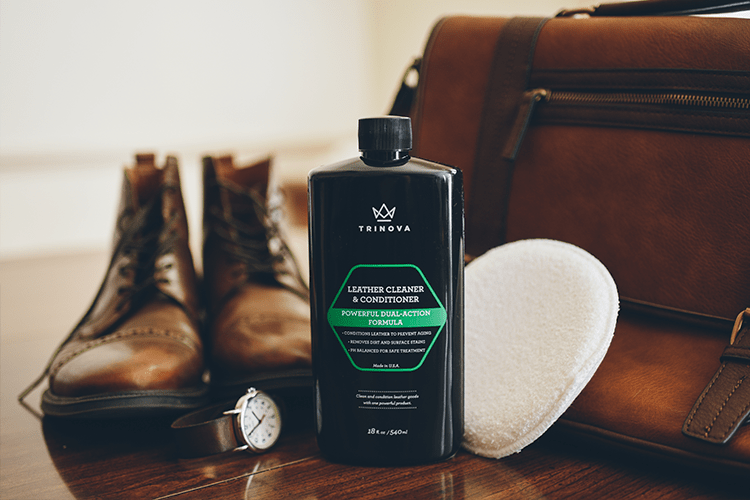 TriNova Leather Cleaner & Conditioner’s easy-to-use solution cleans, conditions, and protects leather in a single application. 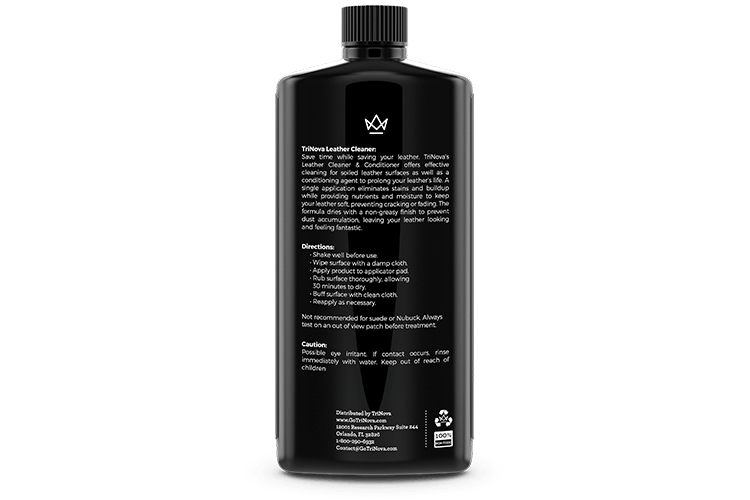 This combination product will clean dirty leather as well as restore color to faded pieces of furniture or well used handbags. Neglected leather breaks down more quickly, fading and even cracking. By nourishing the surface and protecting it from UV rays you’ll ensure your leather stays in the best possible shape. 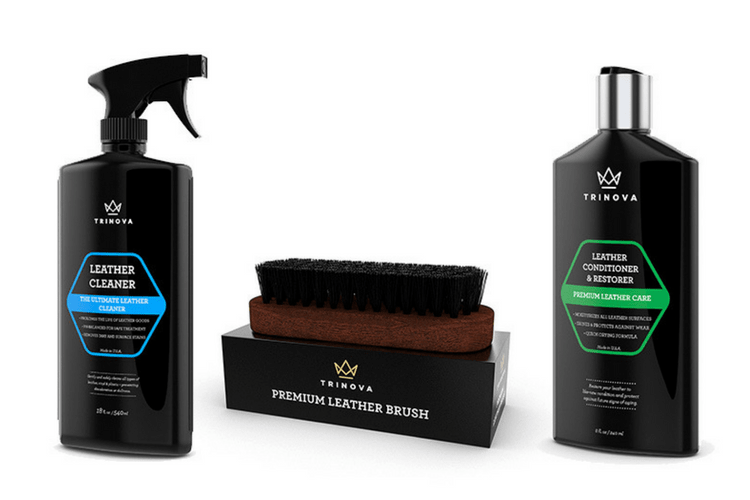 TriNova has established itself as a leader in leather care, meaning you can purchase with confidence. Shake the bottle well before use. Clean the leather by removing excess dirt with damp cloth. 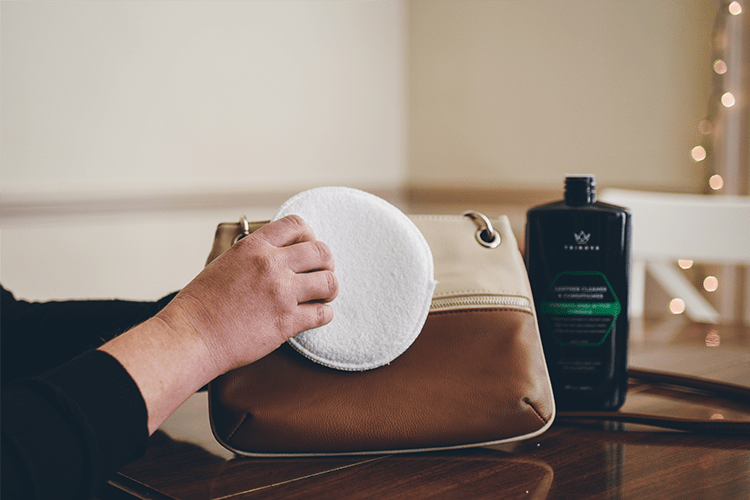 Apply the formula to the enclosed applicator pad and rub thoroughly onto the leather surface. You may also use a clean cloth to apply the product. Allow to dry for 30-45 minutes and then use a dry cloth to gently buff the surface. Reapply, if necessary. Use once a month for effective maintenance of your leather. Check manufacturer’s labels for any additional warnings. Keep out of reach of children. 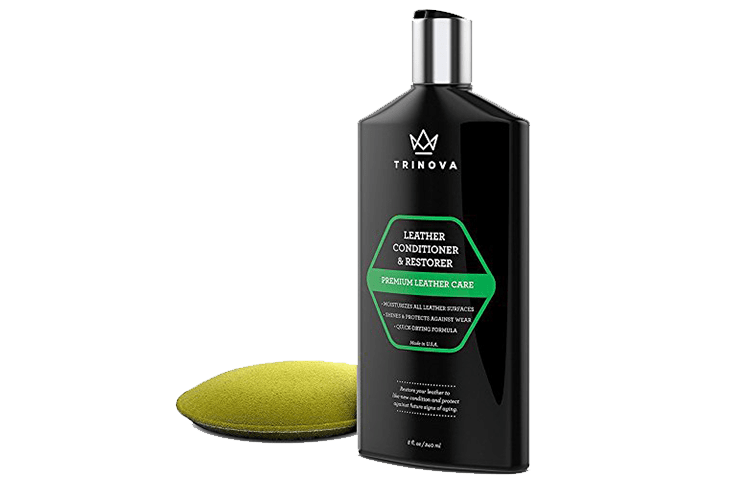 TriNova® Leather Cleaner and Conditioner is rated 4.3 out of 5 by 4. Rated 5 out of 5 by Klasse Act from Great product to start with! So on newer leather this product does the trick. Because it cleans and protects it saves you a step. My wife's Mazda 6 is 11 years old with 187K and has been maintained during the 7 years we've owned it but this product is easy to use because of its 1 step system. Once applied it's a little shiny but toned down over time or you can buff it down after 30 minutes so you can drive it (if treating the steering wheel like I did) If time permits I'd leave it alone and let it dry on it's own. 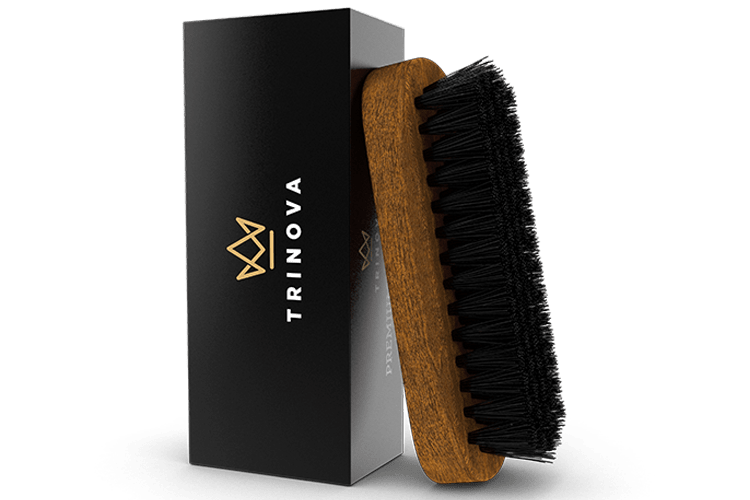 On leather that's been really abused, start with this and then follow up with TriNova conditioner/restorer and for that product, it needs to dry properly as its soaking into the leather. Remember, leather is dead skin and it needs to be conditioned, these are great products for this! 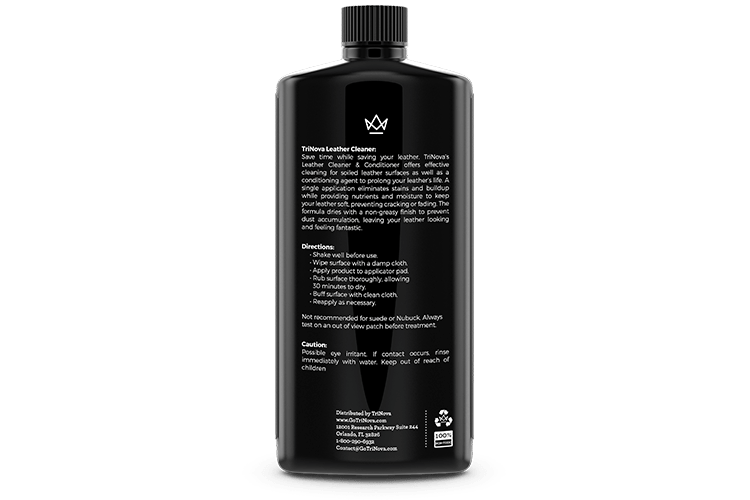 Rated 3 out of 5 by Cherry Kay from Quick way to clelan You must read the instructionsTry a small portion I used it to clean my leather handbag it worked a treat.Leather suite looks good but at first glance looked very wet until it dried.Don't spill any on a wooden floor it makes it very slippery .When I opened the bottle I was unable to close it again as the bottle top (inside) was damaged. 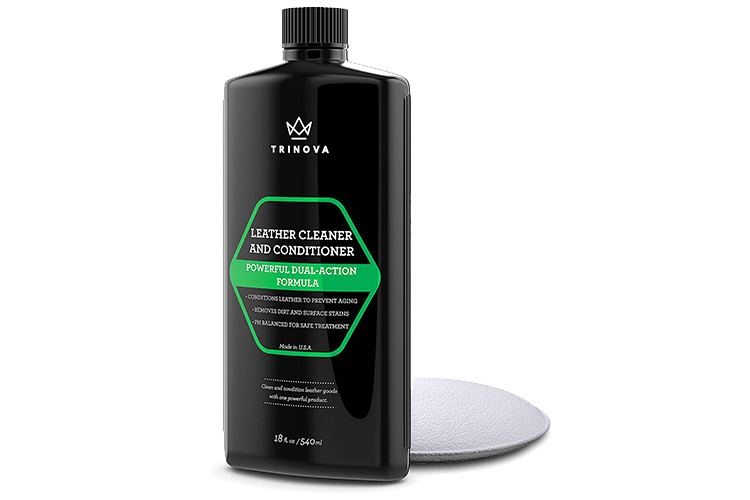 Rated 4 out of 5 by Peter Ferguson from Leather conditioner and cleaner Used on a leather arm chair along with an alternative product.TriNova's is a thin liquid and the other brand I used is a thick creme. Both darken the leather slightly reducing the visibility of scrathes. Imperceptible if any difference in the end result between them.